This paper discusses the idea that for Ontario’s colleges to meet the intentions and legal requirements of their original mandates, they will need to consider extending the scope of their advancement departments to implement key components of both the Total Resource Development Model (Worth, 2002, ascited by Barrette, 2013) and the Strategic Philanthropy Model (Porter and Kramer, 2002). A delay in adopting these philanthropic tenets may jeopardize the future evolution of the college system. To set the stage for the analysis, the first section of this paper will provide a brief history of the purpose and development of the college system in Ontario with particular emphasis on their legal mandate. The concept of access and social inclusion has attracted a myriad of students with dissimilar-learning styles and challenges, with many requiring different (and costly) levels of resource support (social, academic and financial). The next section of this paper then briefly reviews college student demographics and outlines the crucial relationship between the learner and resource needs. These needs, including some that may have been unanticipated at the inception of Ontario’s college system, are critical to realizing both the legal and original intended mandate of the system, and to support learners to successfully obtain their credentials. A review of the current college funding system is also presented with the author’s forecast for future needs, outlining the tense relationship between public and private funding. In examining potential solutions to funding in higher education, Total Resource Development (TRD) (Worth, 2002, ascited by Barrette, 2013) will be put forth as an option that encourages the advancement departments to look at alternate ways of developing revenue in addition to strictly philanthropy. The TRD concept is then supplemented with the introduction of Strategic Philanthropy (Porter and Kramer, 2002), through which colleges can align their resources via the external donor (investor) viewpoint. The final section of the paper explores a model called The Giving Matrix, in which the author attempts to explore the relationship between altruistic philanthropy versus financial contributions and their social / economic impacts. This is an endeavor to provide a deeper understanding of how colleges can organize their advancement departments to better attract Strategic Philanthropy dollars. In 1967, the Honourable William G. Davis, then Ontario’s Minister of Education, presented the Basic Documents to the legislature, which gave birth to the Ontario college system. At that time, there was a substantial need to train a new group of workers to enter the labour force due to a number of factors including the explosion of the knowledge economy, the creation of a larger labour pool, and the increase in the post-secondary aged students. Minister Davis saw the need to create a different type of post-secondary market with the concept of accessibility, inclusion and community development in mind. In the Basic Documents, Davis stated, “we must turn our attention to the post-secondary level, where we must create a new kind of institution that will provide, in the interests of students for whom a university course is unsuitable, a type of training which universities are not designed to offer”(Basic Documents, 1967, p. 11). Ontario was the third province that introduced the college system, behind Alberta and British Columbia. This system was based on the premise of “separate but equal,” compared to universities. Colleges would be seen as terminal education, with an emphasis on vocational skills, from which students would enter into the workforce immediately after graduation – there were no pathways developed to transfer into universities, thereby creating a binary system of higher education in Ontario. Parallel to Trow’s (2010) theories relating to elite, mass and universal education, colleges today can be seen as somewhere between mass and universal education. to meet the educational needs of adults and out-of-school youth, whether or not they are secondary school graduates. At that time, he recommended 19 locations in which community colleges would be established, one situated neatly in each community. The objects of the colleges are to offer a comprehensive program of career-oriented, post-secondary education and training to assist individuals in finding and keeping employment, to meet the needs of employers and the changing work environment and to support the economic and social development of their local and diverse communities. 2002, c. 8, Sched. F, s. 2 (2). The Ontario college system is based on access –social inclusion with a need to generate job-ready graduates resulting in an increase in tax payers. The very fact that colleges are situated in local communities means that learners could physically access these learning institutions without huge cost barriers, compared to university counterparts which were largely set up as residential schools. Colleges were commuter schools that students could attend and still hold part time jobs during the year. The tuition costs were substantially lower than those of the universities (Ministry of Training, Colleges and Universities, 2011). The college characteristics attracted a different type of learner. Those who were not considered “university-bound” or “main stream” attended college. These learners include, but are not limited to, students who are from lower socio-economic backgrounds, differently-abled, single parents, first generation, and Aboriginal students who may be in need of additional services such as tutoring, ASL interpreters, counseling, financial support, etc. There is much research supporting family background and educational attainment, where a positive correlation is directly linked to higher socio-economic status (SES) and lower educational attainment is related to lower SES backgrounds (HECQO, 2009). The additional academic and non-academic related support means a higher level of resource requirement (and subsequently costs) for colleges to deliver on their core and legal mandate. Given the demographics of Ontario college students and the additional resource requirements to support these learners, there is a unique challenge given the current financial situation between the distribution of public and private revenues. In a personal interview with the author on June 9, 2014, The Honourable William G. Davis stated, “There are two issues with the College system today, the first one is fiscal, and the second one is that colleges are maturing…” This is indeed an interesting time in the history of Ontario’s colleges. All of these characteristics present different challenges for Ontario colleges, each unique to their communities (i.e. Northern colleges have a larger Aboriginal student population, while urban colleges have a larger immigrant population). Due to the mission of colleges, there is a substantial need to consider both the academic and non-academic supports related to the delivery of education with the unique needs of the learners in mind. This clearly puts upward pressures on funding that colleges are to meet. Moreover, the ability for colleges to serve the original and legal intentions of the system presents an interesting fiscal challenge. The growth of the student population in Ontario has come to an all-time high – there are approximately 200,000 (Colleges Ontario, 2013) full time students attending colleges as of 2012 and there is a direct relationship between student enrolment and public funding incentivizing colleges to expand through growth. This results in an interesting dynamic, causing stress between the publicly and privately funded aspects of a college education. In its most simplistic form, the overall funding system for Ontario colleges is made up of two revenue categories: private dollars (i.e., tuition, donations, revenue from endowment funds, etc.) and public funds (i.e., provincial grants, federal grants, etc.). The importance and distribution of funds within these two areas has changed over the last few years. (It is noteworthy that colleges were only legitimately allowed to raise funds through donations as recently as 1996). Although the province has other types of funding (i.e., capital), this paper will only review operating grants. The chart below (Figure 1) categorizes private dollars and publicly funded revenues of the college system. The tension between private and public funding continues to be a dilemma in today’s environment. Some may see post-secondary education as a personal quest and the ultimate benefits are for the individual rather than society; these believers may agree that the tuition fees should float as the market requires, and the attender should bear the actual cost of their education. Others see post-secondary education as a public good, and the more educated Ontario’s citizens are, the more the province will benefit; this group may see the government as the primary funders of education. This paper does not intend to address this issue, however, the reality of the situation is that the push on the private funding side is becoming increasingly apparent. It is interesting to examine the distribution of private dollars and government funds to review the changes in the last five years (Figure 2). (Data extracted from Colleges Ontario annual reporting). Based on the current socio-economic status of college attenders, it would be unrealistic to turn to college students and families to make up the financial gap through tuition increases. Colleges need to be even more creative in finding different ways to fund programs, capital expenditures and scholarships to meet the needs of future college intenders – while still delivering upon the core and legal mandate of the system. A model of interest worth considering is Total Resource Development (TRD) (Worth, 2002, as cited by Barrette, 2013). TRD is a concept related to expanding Advancement Departments to look beyond the philanthropic dollar to include other areas such as partnerships, supplier / vendor relations, purchasing co-ops, etc. – new sources of revenue that can fit either under the charity umbrella or be considered an alternate form of revenue. There is also a new paradigm in the external corporate world, utilizing philanthropy to yield both social impact and competitive advantage for organizations: Strategic Philanthropy (Porter & Kramer, 2002). This is defined as “True strategic giving, by contrast (to cause-marketing), addresses important social and economic goals simultaneously, targeting areas of competitive context where the company and society both benefit because the firm brings unique assets and expertise” (Porter and Kramer, 2002, p. 58 Harvard Business Review). Simply put, organizations or donors are looking to invest or donate in a relationship that will yield both a competitive advantage and have social meaning. Partnerships, corporate collaboration and philanthropy are underdeveloped in Ontario’s colleges, compared to their university counterparts (could be due to the shorter history of colleges). In order to sustain the current and future fiscal situation, colleges will need to rethink their strategies which may include TRD and Strategic Philanthropy. There are a number of existing relationships colleges hold that could bring different sources of non-traditional revenue into the books (e.g., strong employer ties). Corporations are always looking for ways to provide professional development opportunities for their staff. Colleges, in the past, have done some corporate for-profit training; however, in the current landscape, it is very difficult to compete with certificate / workshop courses that are delivered by competing universities (e.g., Shulich). However, in re-thinking the relationship, colleges have an abundance of interesting facilities that could be used for experiential corporate retreats and team building activities. These services / experiences could be bundled into “corporate packages.” One example would be to offer day-long meetings or workshops with a team-building cook-off at the end of the night in one of the college’s culinary labs. There are a number of different bundling packages that could be offered to generate revenue that is not currently part of the traditional revenue stream. Purchasing co-ops are another example of TRD. The 24 colleges in Ontario could expand their already existing relationships with suppliers; stationary, equipment, software (i.e. Banner – student information systems) and service contracts are just a few examples of leveraging the massive purchasing power to not only realize savings, but also to negotiate better service and re-allocating the savings to other areas of need. Students – a culture of philanthropy and giving back could be embedded into programming and student life initiatives from the day of entry. The expectation is not that they would donate during their time as a student, but to create an expectation that someday, they will be approached to support their school (likely when they become alumni). There are currently some programs related to fund raising or special events that require students to raise funds for a cause – another way in which colleges are adopting hands-on learning. New student orientations, intersession activities and workshops could serve as a vehicle to develop a culture of philanthropy within the student body that spans after graduation. Alumni – graduates of Ontario colleges could be a large and important source of revenue. Alumni may be able to provide a sustainable base of revenue through smaller, frequent donations (e.g., $10 per month). There have been some challenges with colleges “breaking through” with this group, largely due to the short institutional history and the resources required to capture the data manually (going to through the last 30 years of paper records prior to the launch of student information systems). Technology is a key venue for today’s graduates, and the new way to capture market share will be through the different technological platforms (Facebook, Twitter, online fundraising technology) and innovative strategies embedded into a meaningful social cause for today’s alumni. Colleges could become more successful at capturing this group if they consider leveraging technology platforms as a key part of their strategy, and ensure the processes and systems are in place to recruit potential alumni donors in the years to come. Private donors – the historical altruistic donor is far and few between today. Lester Salamon writes about the challenges the not-for-profit (NFP) sector faces with government cuts, resulting in user fees as replacement costs, “(attracting) for-profit businesses into the traditional fields of nonprofit action, creating a serious economic challenge to this sector” (Salamon, 1999, p. 5). The philanthropy department’s traditional goal is to cultivate relationships with private donors who have the capacity to give, resulting in a sizable donation to the institution. Salamon would likely suggest that the trends are changing. There is an appetite for the government to leverage private dollars against certain funding arrangements. For example, the Federal government flows funds through the Natural Sciences and Engineering Research Council (NSERC), the Centre for Innovation (CFI) and Medical Research Council (now known as the Canadian Institutes for Health Research - CIHR) (Lang, 2001). In addition to meeting specific eligibility criteria, some of these funding arrangements only make grants available if there are private dollars to be matched. This can become very attractive to the donors, especially if they are interested in the areas of research or programs that these matching dollars are available. A cautionary note: colleges should consider not entertaining new initiatives for the sake of acquiring this type of funding, but align current strategic projects as already identified as part of the business plan. Charitable foundations – according to the Philanthropic Foundations of Canada, $85 million was granted to Education in 2012 from their members. The private charitable foundations are a huge market for Ontario colleges. Development offices could think about the skills and talents needed within the organization to win these foundations over. The ability to write compelling grant proposals, applications, and aligning activities / programs with the desired social impact is extremely important. The size and scope of the Foundations in Canada can be a meaningful source of philanthropic dollars. Legacy – the concept of leaving a legacy gift or bequest is becoming increasingly popular. As baby boomers are getting older, they are looking for ways to continue their legacy beyond their lifetime. This may be in the form of an endowed scholarship, the naming of a building, etc. To start these types of relationships, it is important to connect with the estate planning divisions of financial and private institutions. Colleges can find out about the different programs and promote their institution as an area where one may consider leaving a legacy gift. There is also a unique relationship between TRD and Strategic Philanthropy. The development of a TRD concept within Ontario colleges could fit perfectly together with an external organization’s Strategic Philanthropy mandate. Aligning programming, capital needs and student benefit with the need to develop talent, increase market share and gain a competitive advantage - these two concepts could fit together like puzzle pieces. Is there a happy meeting place between these concepts of TRD and Strategic Philanthropy? What do institutional fundraisers need to do to capture the attention of organizations (or individuals) to choose their cause? Quadrant A (top left) would measure the degree of social impact gains while making a financial investment. This quadrant would yield some form of financial and social gain for the donor. For example, there is a courier company in the greater Toronto region called, Turn Around Couriers. This company only employs at-risk youth to deliver parcels on bicycles in the Toronto region. Their customers could use FedEx or other large courier services; however, they choose to use Turn Around Couriers because they are not only advancing at-risk youth, but they are also friendlier to the environment as the couriers are on bikes, and are non-polluting (not to mention the health benefit to the couriers as they are exercising regularly). The financial investment that customers make is to purchase their service, but there is a social impact on their investment. They are supporting at-risk youth at advancing their careers and lives, they are supporting less pollution in the environment, they are helping people become healthier and getting their parcels delivered on time. Quadrant B (top right) would measure the degree of economic impact on financial investments. There is no social impact in this quadrant. This is strictly a financial investment made to yield financial returns. A general example of this would be to purchase stocks on the market. A purchaser buys certain stocks in the hope that it would yield a financial return. This quadrant is about return on investment. Quadrant C (bottom left) would measure the degree of social impact on altruistic philanthropy. This quadrant would represent the historical context of philanthropy (true altruistic giving for the greater benefit of society, without a requirement of any recognition). Although rare, it still happens today. In April 2014, Dartmouth College received its largest anonymous gift in its history: an outright gift of $100 million. Although the first $50 million is intended to “strengthen Dartmouth’s academic excellence” and to be used at the sole discretion of the President, this stipulation could be arguably an unrestricted gift (meaning the donor has not intended it for any specific purpose). This recent monumental gift would fit neatly into this quadrant. (As a point of interest, Dartmouth College is a private institution; however, there was a point in its history, back in 1769, when the state of New Hampshire wanted to make it a public institution. It was due to the original endowment contract establishing the college that allowed Dartmouth to keep its independent status through contract law. There was a legal obligation for Dartmouth to keep its promise to its donors; therefore, any intervention by the state was prohibited). 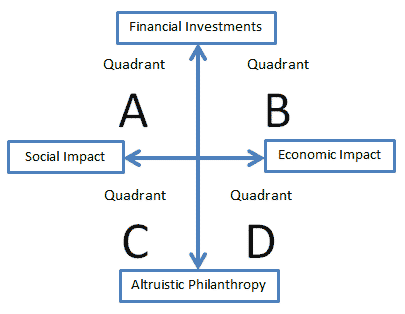 Quadrant D (bottom right) would measure the degree of economic impact through altruistic philanthropy. An example of something that would fit into this quadrant is an altruistic donation that would help build a community center, library or hospital that would generate jobs and other businesses as density increases. Or a donation that supports research projects that have the potential to commercialize products or services creating an economic return / impact. There is no expectation from the donor to receive any benefits in return, including any form of recognition, but there is a measureable dollar return created by the donation. This model is in its infancy stages and requires much more extensive research to realize its full potential; however, this paper is intended to provoke thought and debate. This is a start for Ontario’s colleges to rethink their strategies and how advancement / development divisions are structured. The ideal quadrant for any not-for-profit organization would be highly dependent on the needs of each charity; however, for Ontario’s colleges, it would arguably be somewhere in the A, C, and D quadrants or a combination thereof. Ontario colleges could re-organize or grow their internal advancement departments to reach the different donors (investors) that the matrix may reveal as an opportunity. These departments could think about aligning their resources to match the external donor’s strategic philanthropy needs to gain both competitive advantage and social impact. Short of this type of inclusive approach and understanding of both internal changes and external needs, Ontario’s colleges may be leaving money on the table. Colleges play an important role in advancing the socio-economic status of individuals, communities, the province and arguably, the nation. The original mandate and legal requirements of colleges attract a diverse type of learner (different than any other post-secondary student) requiring special academic and non-academic support that will help them be successful. The current challenge, however, is how to fund the ever-changing needs of students as the public dollar is decreasing every year and the private dollar is required to make up the difference. Based on the SES of college attenders, it is not realistic to expect that tuition will fill this funding gap. Colleges need to look at different sources of revenues to expand the private contribution to the college’s bottom line. A solution to consider may be TRD; expanding the role of advancement departments to move beyond the scope of altruistic philanthropy to incorporate other areas of revenue generating opportunities. In order for college advancement departments to be successful at their expanded roles, it is also important to have an awareness of Strategic Philanthropy and how it can attract new donors to the table. Colleges can then align their programs and ‘causes’ to attract the strategic philanthropic dollar. A “Giving Matrix” is introduced to better understand the cross section of philanthropy-investment and social-economic impact. This matrix is in its infancy stages; however, it can be used to start the conversation relating to how advancement departments can steer their strategies to attract a different type of donor. Total Resource Development in colleges will become increasingly important in funding the future fiscal challenges of Ontario’s colleges in order to prevent the risk of serious deterioration of programs, infrastructure and a quality education. As Bill Davis said in a personal interview with the author, “There are two issues with the College system today, the first one is fiscal, and the second one is that colleges are maturing”. As we near the 50 year mark of the Ontario college system, we have come to a pivotal moment where new and innovative philanthropic strategies must be considered to meet the inevitable funding shortfall. Colleges Ontario. (2013). Student and Graduate Profiles - Environmental Scan 2013. Toronto: Colleges Ontario. Dooley, M. D., Payne, A. A., & Robb, A. L. (2009). University Participation and Income Differences: An analysis of applications by Ontario secondary school students. Toronto: Higher Education Quality Council of Ontario. Lang, D. (2001). Financing Higher Education in Canada. Toronto: Higher Education Group, OISE/UT, Technical Report. Salamon, L. M. (1999). The Nonprofit Sector at a Crossroads: The Case of America. Voluntas: International Journal of Voluntary and Nonprofit Organizations, 5-23. Service Ontario e-laws. (2009). Ontario Colleges of Applied Arts and Technology Act, 2002. Toronto, Ontario, Canada. Cindy Gouveia is the Chief Development Officer, George Brown College Foundation at George Brown College in Toronto, Ontario Canada. She can be reached at cgouveia@georgebrown.ca.